I am going to flat out say it. When you come to visit us at the shoppe, we are going to ask that when you come in our doors, ALL of your children come in the doors with you. Please do not leave your little ones in the car. Even if they sleep; even if your car is still running. Please bring them in with you. Don't want to wake them? You can do a website order, and we will BRING it to you at the car. Stay there with them. Item you need not on line? Call us. Do a phone order, and WE WILL BRING IT TO YOU at the car. 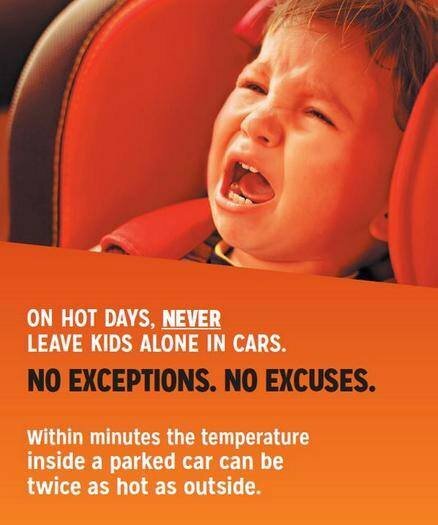 Just do not leave your little ones in the car. Here are some disturbing facts. Since 1998 the average number of heat stroke fatalities each year is 37 according to noheatstroke.org. And here in Texas we have the highest numbers of deaths. From 1998 to 2015, 100 infants have died of heatstroke in cars. This factoid is disturbing. Nearly 20% of deaths occur because a caregiver intentionally left the child in the car. This is not the cases where someone was doing their routine of going to work and forgetting, this is from DELIBERATELY leaving the child in the car. Animation by GM and Jan Null, San Jose State University. Here are some tips to keep in mind based on information from the National Highway Traffic Safety Administration. 1. It takes 10 minutes for the temperature in a car to go up 20 degrees Fahrenheit. 2. Cracking a window open and parking in the shade aren't sufficient safeguards. 3. A child’s body temperature can rise up to five times faster than an adult’s. A child dies with a 107 degree body temperature. 4. Even if it’s in the 60s outside, your car can still heat up to well above 110 degrees. 5. It only takes a 57-degree outside temperature to cause heatstroke. 6. On an 80-degree day, temperatures inside a vehicle can reach deadly peaks in 10 minutes. The Texas Law is with us on this one. Please note we are not judging here. We know what it is like to be sleep deprived, to be grateful for that nap that is finally happening. Which is WHY we will come to you at the car. We want you to get what you need and we want our babies and kids to be safe.